The Los Angeles International Film Festival (LAIFF) has grown by leaps and bounds since its inception in 1995, and is now arguably one of the top ten film fests in the country. It is certainly the premier showcase for new independent film and filmmaking talent on the West Coast. The winners of the fifth annual LAIFF were announced at the recent closing ceremonies. For the first time in five years a non-fiction feature won the festival's coveted Audience Award. 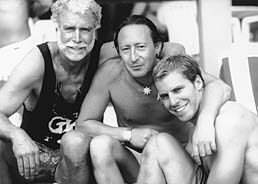 Pop & Me, Chris Roe's documentary about fathers and sons, was the favorite amongst festival goers. The film eavesdrops on the relationship of the filmmaker and his father as they travel the world for six months interviewing other fathers and sons. Ten of these relationships are examined in Pop & Me, including that of Julian Lennon and his famous dad. Chris Roe's prize includes $5,000 of Kodak film stock, $4,000 in processing from CFI and $45,000 of promo services from Box Music Network. Pop & Me director, Chris Roe, with Julian Lennon and Richard Roe. Chris Landreth's Bingo was awarded Best Short, which earned him a $2500 Writers Boot Camp scholarship. The Best Director Award went to Ed Radtke for the teen runaway film, The Dream Catcher, while Best Screenwriter honors went to Jaffe Cohen and Chris Livingston for Hit and Runaway, a comedy about independent filmmaking. Radtke receives $2500 from the Directors Guild of America and Cohen and Livingston receive the same amount from the Writers Guild of America. The new recipient of the LAIFF's Production Grant Program was also announced at the festivities. A script about street hustlers, entitled Lost in the Pershing Point Hotel, written by Leslie Jordan (to be directed by Tracy Aziz and produced by Julia Pierrepont), will benefit from a goods-and-services package from leading suppliers such as Kodak, Panavision and CFI. Judith Godreche and Stephen Dorff in Phil Joanou's new film, Entropy, which opens the 5th Los Angeles Independant Film Festival. LAIFF prides itself on premiering the best of the American independent film movement. This year's line-up includes 26 world premieres. The festival will close with the world premiere of George Hickenlooper's The Big Brass Ring, starring William Hurt, Miranda Richardson and Nigel Hawthorne. The film is based on Orson Welles' screenplay with Oja Kodar. 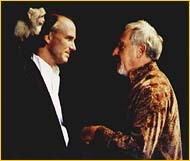 William Hurt and Nigel Hawthorne in the closing night film, George Hickenlooper's The Big Brass Ring. A number of other events are scheduled for this year's LAIFF, including "40 Years of Indie Cinema: A Path Revisited," a sidebar of cutting-edge films from the past four decades and post-screening discussions with the filmmakers. Some 17 seminars will be held at the DGA and The Laugh Factory and The LAIFF Indie Supporter Award will be presented to LA's leading specialized exhibitors, Robert and Gregory Laemmle, at the closing night festivities.